Apple iPad: It Makes Salsa, Too! Apple's iPad, it seems, really can do almost anything. 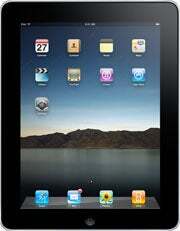 The iPad, set to go on sale this Saturday, has been touted as a "magical and revolutionary" device. But while Steve Jobs showed off functions like Web-browsing and movie-playing, he never mentioned the iPad's amazing kitchen potential. Thankfully, Stephen Colbert and David Letterman are here to fill us in. Stephen Colbert pulled out an iPad during Thursday night's "Colbert Report" on Comedy Central. Colbert's no stranger to the iPad -- he first wielded one while presenting at January's Grammy Awards -- but this time, he took things a bit further. First, Colbert answered questions as to how he obtained an iPad before its official launch. His secret, he said: giving up a kidney. "Luckily, there is an app that filters urine," he noted. Colbert also compared the iPad to Apple's iPhone, pointing out its -- shall we say -- similar features. "If you've got an iPhone already, a lot of it will be very familiar to you: the same touchscreen technology, the same apps -- and just like the iPhone, you can't make calls with it," he said. But it's Colbert's iPad salsa-making demo that's drawing the most attention. The video sums it up best. If you're an Apple fanboy, however, be warned: Watching this clip may cause you to experience severe emotional distress. If you didn't like how Colbert handled the iPad, you definitely won't like how David Letterman does. Letterman focused his entire "Top 10" segment on Apple's iPad Thursday night, first giving a brief demo of the device as only Dave could do. "For people who don't have kids or who don't like the kids they have, it comes with photos of a family," Letterman joked. "So you're not buying an unnecessary electronic device, you're buying a family." After shaking the iPad, banging it on his desk, and licking it -- yes, licking it -- Letterman went on to describe the iPad's "incredible" amount of radiation, explaining that "you're supposed to wear a lead apron when you operate it." He then used the iPad as a coaster, a move later emulated by guest Sam Worthington. Salsa-making? Family-building? Coffee-coastering? You know, maybe this thing really is magical and revolutionary after all.